Zao Winter Chic Natural Eyeshadow Palette is refillable: change your eyeshadows to create a chic or glamorous makeup according to your desires ! 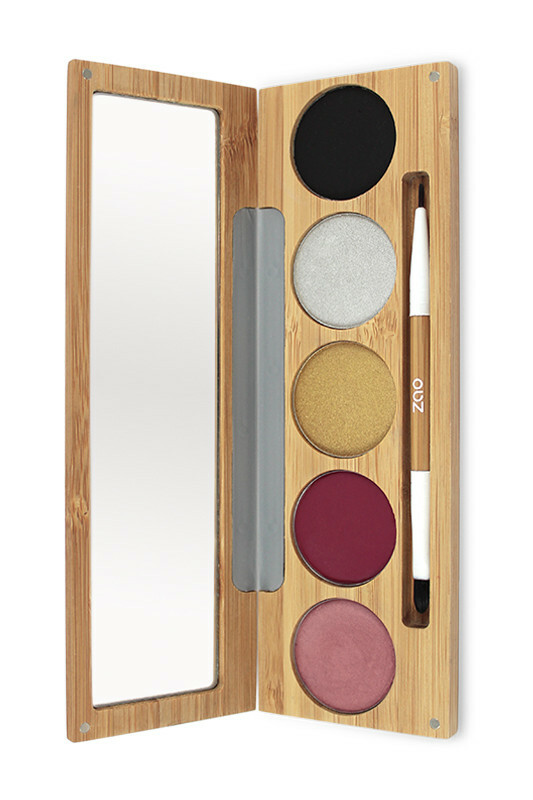 ZAO Winter Chic Natural Palette, the must-have for a chic or glamorous makeup ! For a everyday make-up: Apply the gold or silver eye shadow to the entire eyelid. Draw a line of eyeliner using the thin side of the wet brush. Then apply the cream blush to the cheekbones with your finger and finally apply the purple lipstick with the brush. For an evening makeup: Apply the gold or silver eye shadow on the whole eyelid and the black eye shadow (dry brush) on the outer corner of the eye for an intense look. Then draw a line of eyeliner using the thin side of the wet brush. Apply the cream blush with your finger on the cheekbones and also on the lips with the brush. Tip: For a deer's eye, draw a thick eyeliner line with the lip side of the brush. BLUSH CREAM: This pearly blush is a real complexion-enhancer with an instant glow. This cream blush can also be used in lipstick, alone or as a shiny touch on purple lipstick. Made with organic babassu oil, a vegetable oil that has extraordinary regenerating and antioxidant properties. LEAVY LIP RED: Its beautiful deep purple red colour embellishes and brightens the lips and gives them a glamorous and pulpy effect. The combination of organic castor oil, organic jojoba oil and organic shea butter makes it possible to sublimate, moisturize and protect the lips. GOLD EYESHADOW: By day or by night, this magnificent golden iridescent and luminous gold is a must have to give depth to the look. SILVER EYESHADOW: Thanks to its iridescent pearlescent, this eye shadow can create areas of light to illuminate the eye. Eyeshadows are rich in organic rice powder. This ingredient adjusts the sebaceous secretion without clogging the pores of the skin. EYELINER CAKE: This ultra-pigmented black eyeliner cake is perfect for intense eyesight. With the help of the fine side of the wet brush, the Eyeliner cake makes it possible to make a precise drawing. Dry, the Eyeliner cake also serves as an eye shadow for a smoky look. For more softness, the eyeliner cake contains organic shea butter and organic macadamia oil. The composition of Palette Winter Chic is 100% natural ! INGREDIENTS: GOLDEN SHADOWS 03 GOLD AND SILVER 04: MICA, SQUALANE, ORYZA SATIVA POWDER (ORYZA SATIVA (RICE) POWDER)*, ZEA MAYS STARCH (ZEA MAYS (CORN) STARCH)*, ZINC STEARATE, OLIVE OIL DECYL ESTERS**, PERFUME (FRAGRANCE), TOCOPHEROL, SQUALENE, LINUM USITATISSIMUM SEED OIL (LINEN) MAY CONTAIN +/-: CI 77891 (TITANIUM DIOXIDE), CI 77491 (IRON OXIDES), CI 77492 (IRON OXIDES), CI 77499 (IRON OXIDES), CI 77510 (FERRIC FERROCYANIDE), CI 77007 (ULTRAMARINES), CI 77288 (CHROMIUM OXIDE GREEN), CI 77742 (MANGANESE VIOLET), TALC. INGREDIENTS: MICA, SQUALANE, ORYZA SATIVA POWDER (ORYZA SATIVA (RICE SATIVA (RICE) POWDER)*, ZEA MAYS STARCH (ZEA MAYS (CORN) STARCH)*, ZINC STEARATE, OLIVE OIL DECYL ESTERS**, PERFUME (FRAGRANCE), TOCOPHEROL, SQUALENE, LINUM USITATISSIMUM SEED. MAY CONTAIN +/-: CI 77891 (TITANIUM DIOXIDE), CI 77491 (IRON OXIDES), CI 77492 (IRON OXIDES), CI 77499 (IRON OXIDES), CI 77510 (FERRIC FERROCYANIDE), CI 77007 (ULTRAMARINES), CI 77288 (CHROMIUM OXIDE GREEN), CI 77742 (MANGANESE VIOLET), TALC.